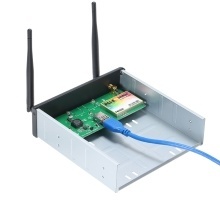 This is an item that combines Wireless Network Card and CD-ROM Expansion Mobile Rack. Fast transmission speed up to 600Mbps rate. It supports multiple interfaces that is very convenient to use. Dual frequency: 2.4G and 5G. Widely compatible with all CPU.